In her senior research paper, StFX student Kylah Lohnes combined her passions for literature and global issues, taking a focused look at child soldier narratives in children’s literature. The high quality of her work was recently recognized when the Fredericton, NB, taking a joint advanced major in English and development studies at StFX, earned honours at the Quebec Universities English Undergraduate Conference (QUEUC), hosted by Bishop’s University. Out of 268 submissions, she was among 60 selected to present at the conference. Out of this 60, organizers chose 26 papers, considered the most-high quality essays to be published, says QUEUC coordinator Chloé Soucy. Ms. Lohnes paper, “The hidden adult of child soldier narratives for children,” is among that number. “I think it is terrific that Kylah’s work has been recognized in this way. Her thesis is about the way that children’s literature about child soldiers aims to teach children and youth how to become global citizens. Not only does her project engage with current debates about human rights literature and child soldier narratives, her analysis of these themes and forms in children’s literature represents an important original contribution to the field,” says English professor Dr. Maureen Moynagh. Ms. Lohnes says it’s gratifying to know that her work stood out, not only for presentation, but also for publication, something she wasn’t expecting. “It’s really exciting and almost surreal in some senses to think about the fact so many talented students submitted,” she says. Ms. Lohnes says she became interested in the topic after taking English 337 with Dr. Moynagh, which looks at topics in children’s literature. 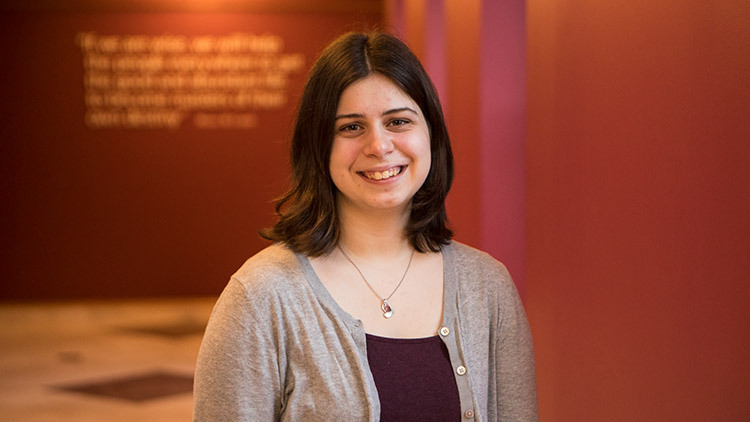 “It combines both of my major passions, English literature and global issues,” she says. Presenting at the conference, she says, was a great experience all around. Not only did it give her experience in presenting and fielding questions, which she says helped her look at her work in new ways, Ms. Lohnes says it was a good opportunity to participate in the peer editing process, to know that people are interested in her work, and to connect with English students from across the country.